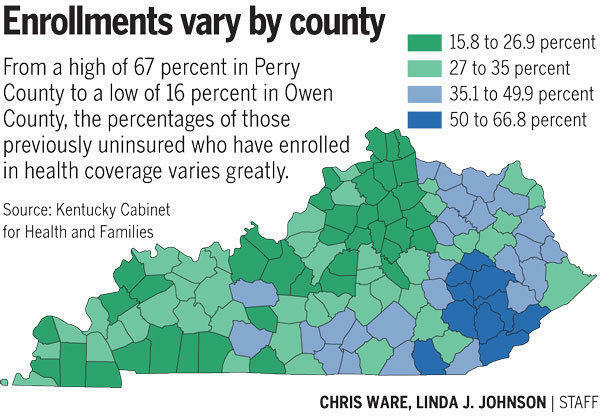 A Herald-Leader analysis of who has enrolled and where shows that the percentage of previously uninsured who now have health insurance ranges from a high of 67 percent in Perry County to a low of 17 percent in Owen County. A cluster of nine contiguous counties in southeastern Kentucky — Perry, Leslie, Letcher, Breathitt, Owsley, Harlan, Wolfe, Lee, Letcher — and their near neighbor, Whitley, have the highest rates of enrollment. The 10 counties with the lowest percentage of enrollees — Boone, Todd, Anderson, Spencer, Christian, Hickman, Crittenden, Meade, Shelby and Owen — are spread all over the state. People in the counties with higher rates of signups say personal connections have helped spur friends and neighbors to sign up. Throughout the state, hospital personnel, nonprofit staff persons and even insurance agents have signed up to become certified "kynectors" — or connectors — people who can promote, explain and help others sign up for insurance. The state bolstered the effort by awarding grants to three agencies to provide kynectors. In Eastern Kentucky $600,000 went to the Kentucky Primary Care Association, which oversees 12 full-time and 2 part-time kynectors and serves all the counties with the highest levels of enrollment. "The kynectors are really great about using their personal networks, churches and families, so there is a face-to-face, one-on-one" interaction with someone who is familiar, explained Lindsay Nelson, state coordinator for outreach and enrollment with Kentucky Primary Care Association. "If we would have hired people from Frankfort and other parts of the state and just planted them in Eastern Kentucky that wouldn't have worked." The primary care association is working with six agencies operating in the area and is coordinating efforts with other certified kynectors, like hospital workers, she said. Plus, they are putting plenty of miles on their cars visiting unexpected places — like a jail where they talked to employees, schools and even gas stations. "It's where the population is that we are trying to reach," she said. The kynectors, she said, "have been very creative." Since the push began in the fall to sign up people, the language has been fine tuned, Nelson said. For example, her kynectors have found it is important to let people know they have options and that they can choose not to sign up, although there is a penalty under the Affordable Care Act. Also, referring to "the Kentucky program" or "new insurance" rather than Obamacare tends to make people feel more at ease, she said. Karen Cooper is director of the Kentucky River District Health Department, which covers seven counties; six of them rank in the top 10 for the percentage of previously uninsured people now enrolled. Because of some of the negativity that surrounded the Affordable Care Act, Cooper said, "it surprises me that they have been able to reach that many people in such a short period of time." Cooper's agency is doing its part, by referring patients to certified connectors, but she hopes to set up Kynect kiosks in her health clinics to help people who might not have Internet connections at home. She is excited about the effort because, while the health department provides some primary care and screenings, they are limited on what they could provide to someone with no insurance. For example, she said, previously the department might have been able to determine if a man had high blood pressure. While they could counsel him on good nutrition and exercise, they couldn't provide medication that might help. If that same man is enrolled in insurance, that changes. Though the enrollment process is nearing an end, it's still too early to determine what's really working and why. Carrie Banahan, director of the state's health insurance exchange, said some counties with a larger number of low income people who qualify for Medicaid might be enrolling at a quicker rate because those people don't pay premiums. Of the 231,367 enrolled in health insurance, 181,705 have enrolled in Medicaid. According to the Herald-Leader analysis, the counties with the highest percentage of enrollment had between 48 and 62 percent of their residents who were eligible for Medicaid. The counties with the lowest percentage ranged from between 39 percent and 46 percent. More urban counties have tens of thousands of uninsured, which may make it harder to move the dial as far as a percentage goes, Banahan said. But Jefferson County, which had 101,000 people uninsured in October, has signed up 30 percent of the eligible residents. In the weeks before the March 31 deadline for the first open enrollment, it will be "very, very busy" said Nelson. After that, she said, the primary care association will be assessing "what communities need a little bit more attention and what needs a little more outreach." The state will be doing the same thing to fine tune its message and methods, said Banahan. Kynect will continue to be visible both because Medicaid enrollments can continue after March 31 and because a second round of open enrollment is scheduled to begin on Nov. 15. Karen Ditsch, executive director of Juniper Health, a public health clinic serving Wolfe, Breathitt and Lee counties, said she knows what's working in her community. It's relationships. Juniper Health is using one kynector through Kentucky Primary Care Association. Because they are a federally qualified health care provider, they have two more funded through a federal grant. "This is a mountain community. It is small, everybody knows everybody. I think they trust us," she said. The three workers for Juniper Health are "very much in tune with the community." Nearly all of her staff grew up in the area and even as a transplant, she's lived there 25 years.